If you have been in airsoft for awhile you have probably heard of airsoft techs or airsmithers as well as seen the endless internal and external parts available for almost every $100+ airsoft gun. If you have done some research into teching you probably have watched one or more of the many videos on how to do it. 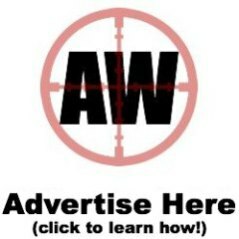 Some of you may think that the prices ($40-$100) charged by airsoft companies like AirsoftGI.com, AirRattle.com, and Evike.com are too much considering that you could do it yourself. Some of you may think that tech work is daunting and are more than ready to send in your airsoft gun to the professionals. And the rest of you don’t understand why you would want to have an airsoft gun messed with when it works just fine. This post is for all of you. I recently had quite an adventure in teching. I will be telling you guys about that experience in an upcoming series. I learned a lot during my adventure into the world of teching. I gained invaluable experience and now have a better grasp on how airsoft guns work and how to help others when their guns malfunction. You don’t learn if you don’t try. Below are the three main options you have when it comes to teching your gun and the benefits and downfalls of each. 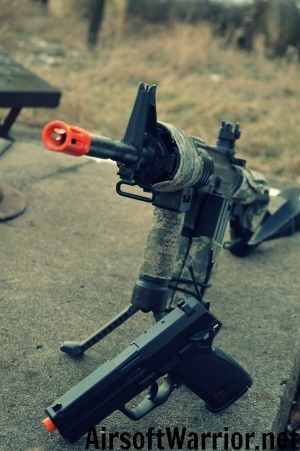 Teching your airsoft gun is an awesome and trying experience. You can learn a ton and improve your gun as well as others. You can also shorten the life of you airsoft gun and break it. So how do you tell if you should do it yourself? 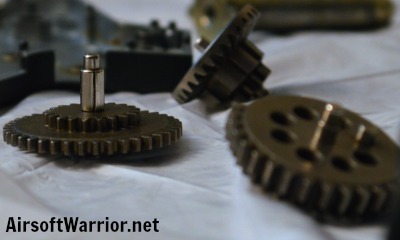 If you have the time, want to learn about airsoft gearboxes, and have the drive to do it, then go for it. Get some good videos, figure out the tools you need, and go to work. It may be best to wait until your airsoft gun malfunctions before opening it so you know that you started with a broken gun and have nothing to lose. Do not tech if you are prone to carelessness or don’t understand what you are getting into. You can only hurt your gun and yourself. The case for a professional is obvious. They have lots of experience, know how to fine tune everything, and often warranty their service. They charge for their service and that is only right considering what they provide. If you are unsure about what you need done to your airsoft gun or are wanting serious upgrades done to it then send your airsoft gun in to a reputable tech service. If you own a low quality airsoft gun or don’t have any reason to send it in then check it out for yourself or leave it alone. This option is the most inexpensive (to start with) and easiest of the three. All you do is leave your airsoft gun alone, wait till it breaks, then buy a new one. This may be the best option for you if you have a low quality airsoft gun, don’t want to get into teching, or are willing to spend a chunk of change down the road for a new gun. If you own a high dollar gun then your gun should work fine with out any teching. A well cared for (don’t run any Lipo batteries, don’t drop it, etc. ), high quality (KWA, G&G Top Tech, etc.) gun should last you several years depending on how often you play. On the other hand, if you want to transform the gun to a CQB from a field weapon or vis versa, want to add power or accuracy, or want the gun to last longer than it might in its stock form then the other two options are for you. I hope this post helps you to determine what the best option is for you. Don’t be afraid to try new things but understand your limitations. In the previous Airsoft CQB posts we talked about how to enter buildings and clear rooms. In this post we will look at some of the gear that will help you be more comfortable and effective while fighting in a CQB engagement. As we have seen, CQB is a very different experience from woodland and field battles. Your tactics change and so should your gear. You need to be very mobile and fast during CQB operations so lightweight and simple is the name of the game when selecting CQB gear. In this post we will check out the clothing, guns, and extras that will meet the criteria for CQB effectiveness. CQB clothing needs to be lightweight and breathable for coolness and mobility. Under Armour type clothing makes a great base layer and lightweight military jacket and pants will give you protection from BBs. Knee pads protect your knees from the hard floors in buildings and come in a variety of colors to match your uniform. 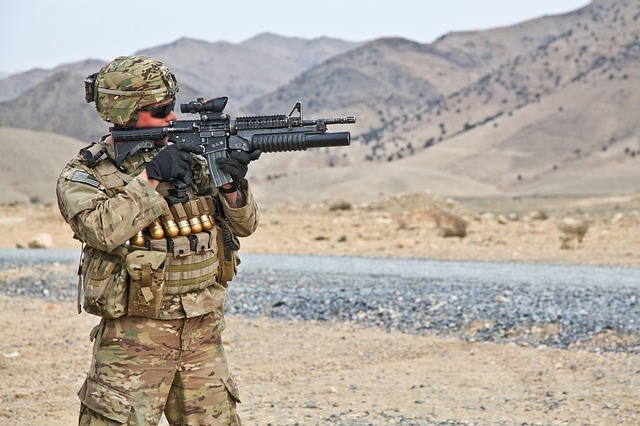 A MOLLE vest is a great way to carry your gear, water, and extra mags in battle. The MOLLE system allows you to adapt your vest to meet the needs of a specific battle and detach/ reattach pouches as needed. I am using the Lancer Tactical Molle Modular Chest Rig w/ Removable Hydration Pouch in ACU. It has all of the features I need for a CQB battle like a hydration pouch, a triple M4 mag pouch, and utility pouches to carry BBs and extra gear. A CQB airsoft gun needs a lower fps than a field gun to keep from hurting other players too badly. It must also have a smaller size to allow you to maneuver through buildings and around corners. Most CQB fields have a 300-350 fps limit for indoor play. One of the guns I have found that is CQB ready is the Umarex H&K UMP . It is affordable at $155, has an fps of 330 with 0.2g BBs, and has a quick change spring feature that allows you to up the power of the gun without any tech experience. My JG M4 CQB has a little too high of an FPS at 380. The Lancer Tactical PDW is also a little on the high side in fps but has a very compact design that is perfect for CQB. In the Extras section I will tell you how you can modify these guns for CQB operations. If you’ve found or have a cool gun but the fps is too high for CQB you can modify your current gun to shoot at a lower fps. The simplest way do this is to purchase an M100 or M90 spring (Note: the lower the number the less strength the spring has) and get it installed. After the new spring is installed test the fps to make sure it it meets CQB limits. With a lighter spring your rounds per second may also increase. I use the Xcortech X3200 for my testing needs. Some CQB fields allow the use of airsoft grenades. Thunder B grenades are loud and disorient your enemy giving you a better chance of clearing the room with less casualties. Smoke grenades may also be allowed. You can use them to confuse or distract the enemy as well as cover your advance. -The JG M4 S-System is a version of the JG M4 CQB, which I did a review on previously. -As with the JG M4 CQB, the JG M4 S-System has a functional charging handle, non-functional bolt catch, and a non-functional forward assist. The humble pistol is an excellent secondary weapon. 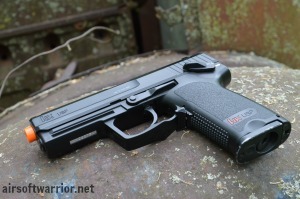 In a previous post I reviewed the H&K USP by Umarex . 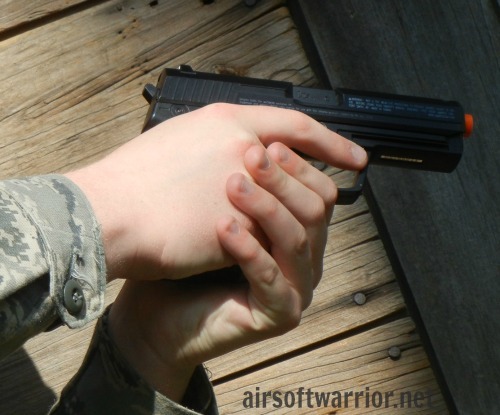 In this post I will explain the pros and cons of the pistol in airsoft and the uses and applications of it on the battlefield. I really like my H&K USP. It was the first airsoft gun I purchased. It has pulled me through in many battles and has seen a lot of action. I now use it as a back up weapon and rely on my JG M4 CQB for most of my combat actions now. But, even though it may not have a high rate of fire or the largest mag capacity on the battlefield, I still like to whip out the H&K and use it. You will see why in this post. Compactness– smaller is better when you are in CQB environments or need to maneuver behind cover. Lightweight– a light pistol will keep you from fatiguing as quickly as an AEG during battle. Power– Airsoft pistols can have speeds of 500 fps or more giving you as much or more power then an AEG in a smaller more maneuverable size. Options– Tons of models, from the 1911 to the Baby Eagle, are available and airsoft pistols are available in spring, electric, or gas operating systems. Lack of Accuracy– a short barrel keeps the BBs from getting maximum stability and the wind effects them more. My H&K USP (C02 powered) still shoots a good 50 feet and can hit a man-sized target if I adjust for wind. But don’t expect one shot, one kill from an airsoft pistol. Smaller Magazine Capacity– Most airsoft magazines hold 10-15 rounds. Some are available with 25+ round magazines but most pistols still don’t have the capacity of a rifle or AEG. Close Quarters– The pistol really shines in the CQB environment as it allows you to cut corners tighter and use cover more effectively because of its compactness. Back-up– Pistols are great back-up weapons because they are light and can be stored on your hip in a holster ready for action if the need arises. 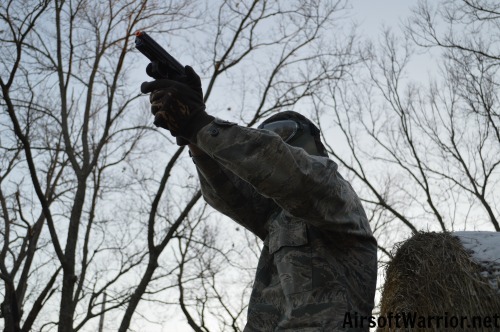 Pistols are an important part of an airsoft arsenal as a back up weapon, and you should try to carry one in your battles. A pistol can save you in battle if your AEG malfunctions or runs out of ammo. Don’t neglect the humble pistol and spend some time practicing with it so you, and it, will be ready. My favorite pistol in my armament is my H&K USP by Umarex . It packs a punch with its CO2 powered system; and its strong 360 fps make it a good choice for a variety of situations you may encounter in airsoft. In a recent battle I eliminated an opponent at 30 feet with a moderate wind blowing when he popped his head up from behind cover for a quick look around! The H&K USP is an excellent addition to any airsoft armament. I recommend buying a metal magazine for your H&K USP. The plastic mags that come with the gun seem unreliable and may malfunction. The metal mag is strong and adds the extra weight to give the H&K a real steel feel. Also you may look at the Umarex TAC converter . That will turn your weapon into an awesome close quarters weapon as well as increase the accuracy for further shots. Airrattle.com sells the H&K USP bundeled with the TAC Conversion kit . Overall the accuracy and power as well as the low price make the H&K USP by Umarex an excellent buy. Spring, Electric, or Gas, which is right for you? 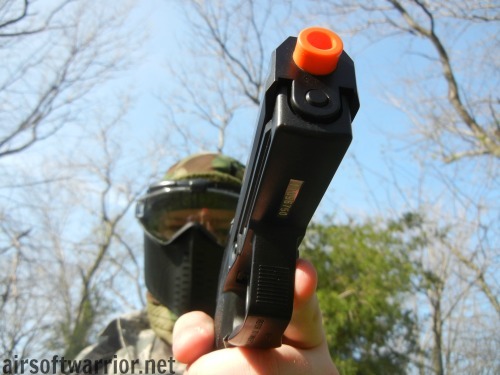 With the large assortment of airsoft weaponry available, it can be confusing even to some experienced airsoft users to determine what firing system they need in a gun. I have used the three basic types of airsoft firing systems,spring, electric, and gas in my airsoft battles and in my arsenal. Here is a basic rundown of the advantages and disadvantages of each. Spring guns are known for their reliability. They use the tension of a spring to drive air forward to launch BBs. They are accurate and often higher powered than their counterparts. Spring guns are single shot and have to be cocked each time after firing; therefore they have a low rate of fire. Spring guns are cheaper than gas or electric and are often lighter. Electric guns have a high rate of fire and are often automatic. Electric guns use a gearbox that rotates using an electric motor to shoot BBs at high rates of fire. Electric operated guns may have a lower power than their spring or gas conterparts and are often more expensive than spring weapons. Electric guns also have to be recharged occasionally. Gas guns are extremely powerful, but they are also the most expensive. They use compressed gas to blast BBs at high speeds. They are very accurate and are heavier than most electric and spring guns giving them a realistic feel. The gas has to be changed out or refilled occasionally for the gun to continue shooting. I really like my gas powered HK USP made by Umarex. I whipped it out in a round and made a headshot on a guy hiding behind a barrier as he popped his head out. A gas gun’s accuracy can be amazing! Whichever gun and firing system you choose remember to do your research and, after getting your weapon, to test it and put it through its paces so that you and it can be at maximum efficiency. What do you think is the best airsoft power system? Spring, Electric, or Gas? I go into battle with my gear and trust it to not fail me. That’s because I wear it, shoot with it, read about it, and learn as much as I can about my gear before I go into combat. If you expect victory, take the time before the battle to fully understand your gear. 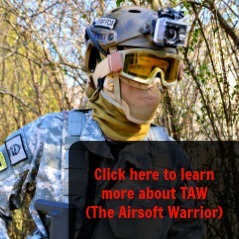 Here is a basic list of what you should bring and wear to an airsoft war. Gun: A rifle, shotgun, and even a pistol will fulfill this need. You can be effective with any weapon as long as you understand its abilities and how it works. Light Jacket or Long Sleeve Shirt: You will need protection for your arms and upper body as this will be the spot the enemy will have the best chance of hitting you. Get a shirt or jacket with good ventilation so it will wick moisture and keep you dry. Mask: A paintball mask is great. A full face mask will keep your ears and your mouth from damage. A single bb in the wrong place can ruin your day so opt for maximum protection. Shoes: Regular shoes will work in most battles. Duct tape the laces to keep them from coming untied and to keep dirt and debris from sticking to them. Pants: You can use any pants you don’t mind getting ripped and dirty. Socks: Hiking socks are a good choice. They are comfortable enough to wear all day long, they keep dirt out of your shoes, and most are moisture wicking. Note: Camouflage clothing is recommended for your basic gear loadout . Blending in with your surroundings is an important strategy in any battle. Holster/Sling: Holsters are great for pistols, and a one or two point sling is a very effective carrying system for a shotgun or rifle. You will get tired carrying a gun through the brush all day long; a holster or sling is the answer. Tactical Vest: A vest with lots of pockets and good ventilation is great for carrying extra magazines, water, extra ammo, and more. Extra Magazines: Extra Magazines will keep you from having to reload at a critical time in the battle. It is especially nice to have extra magazines for your pistols because of their lower ammo capacity. Every soldier owes it to his team to be prepared and starting with the right gear is a great way to show your team you care. Let me know what other gear you bring to a fight!